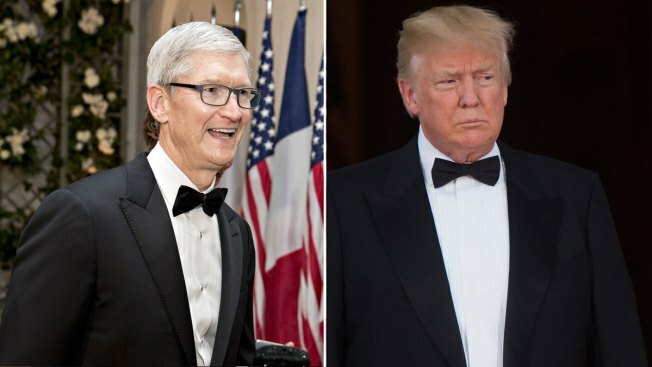 Tim Cook, chief executive officer of Apple Inc., and President Donald Trump at the White House in Washington, D.C.
President Donald Trump met Wednesday with Apple CEO Tim Cook at the White House to discuss trade as he engages in negotiations around the globe. Trump tweeted before the meeting that they would be "talking about many things, including how the U.S. has been treated unfairly for many years, by many countries, on trade." The president met with Cook in the Oval Office a day after the leader of the technology giant attended Trump's state dinner for French President Emmanuel Macron. 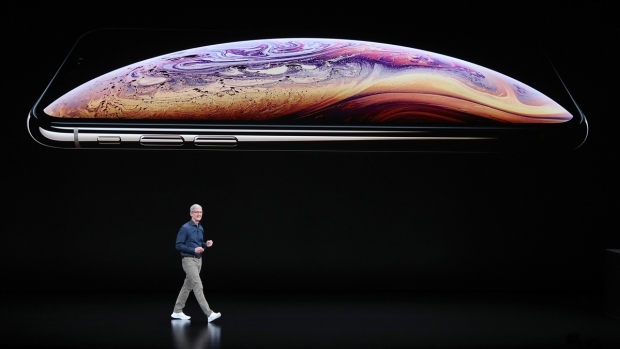 Trump has had a fraught relationship with the electronics company, criticizing Apple Inc. on Twitter over its decision not to cooperate with law enforcement on breaching its phone encryption and over the size of the screens on iPhones. But Trump has praised the Cupertino, California-based company's planned investment in the U.S. after the passage of last year's tax cuts. White House press secretary Sarah Huckabee Sanders said the primary focus of the meeting was trade. Cook also met with White House economic adviser Larry Kudlow. Treasury Secretary Steven Mnuchin is expected to travel to China soon for trade talks as both countries have proposed tariffs of $50 billion on the other's products. Trump has said he's looking to impose tariffs of up to $100 billion more on Chinese goods. The administration is also engaged in negotiations with Canada and Mexico on a revised form of the North American Free Trade Agreement, which Trump assailed during his 2016 Republican campaign.